My son Micah as we’re leaving one of our bear baits. The mixture of oats, sweets, and syrup is under the pile of logs in the background. I am sorry to say we came home empty handed, as far as a bear is concerned, but full of fun wonderful memories from this trip. We had a great time, and it didn’t really matter that the bear, the weather, and the wind didn’t cooperate. The weather was not conducive to bear hunting, but that’s the way it is when playing on “natures” turf. We had torrential rains for two solid days, and wind and rain for several other days. The last day of our hunt we were sitting in our tree stands over this bait, as it had been “hit” the evening before. Just before dark I saw a black shadowy figure, move between trees, about 65 yards to our right. A smaller black form moved behind the larger one, and they then just melted into the underbrush, downwind from us! I saw about 2 seconds of them, and knew we were in trouble, as the wind was blowing right toward the bear. We sat another 1/2 hour, but knew we had been “busted!” The other baits never were “hit” as the bear were just not moving. They don’t like the wind and rain either. Hey there’s always next year. When at the Baldwin bear/deer camp there is always something to do, and I don’t feel sorry for Micah and myself one bit. We enjoyed awesome fall colors, fantastic Marquette scenery, excellent fishing, and the camaraderie of good friends. We had side adventures of chasing a mouse around the cabin, playing cribbage by gas lite, and getting some great “pine martin” pictures on my trail cam. We even got to play nine holes of golf with Matt Baldwin on a beautiful little course not far from camp. I will be blogging about the trip, and our excellent adventure in upcoming post. We are back, safe and sound, as we turn our attention toward the deer woods. 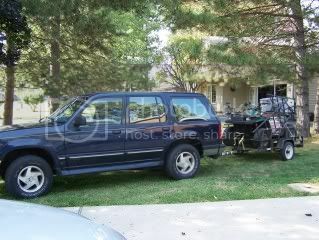 My explorer and little trailer are loaded to the hilt, and I will be hitting the road in just a few hours. Of course a huge thunderstorm is moving across the state with the possibilities of severe weather. That always makes a 500 mile drive interesting. Actually rain is forecast for several days during the week, and could really play a huge roll, as to me successfully bagging a bear. Hey look I’m already making excuses. Picking my boy up in the morning, and we’ll be on our way. If I can find a place to blog while I’m in Marquette, I’ll try to keep you posted. If not it will be at least a week before I’ll be able to do a blog. Hopefully we will have a great time, bear or no-bear. I moved my trail camera to another spot to see how things look on the oak ridge. This area also looks like it will pay off. We also hung a stand in a third area that may end up being the best of them all. There are at least 6 different run-ways that criss-cross one another, by the edge of a swamp. 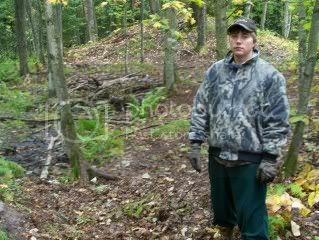 I’m getting ready to leave for bear hunting Wed. morning, and can’t wait to spend some time with my son. I’ll finish packing right after I givebrother Randy a golf lesson. A very big coyote looking for dinner. 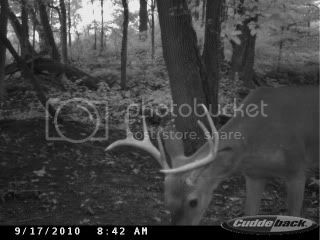 Hope to see him during deer season. Oh my gosh, turkeys too! I got my turkey license, and would sure like to put one of these birds in a roasting pan. Food plots attract more than just deer, as you can see. I may not be blogging for awhile, but should have plenty of good pictures and stories to write about when I get home. Happy hunting everyone. 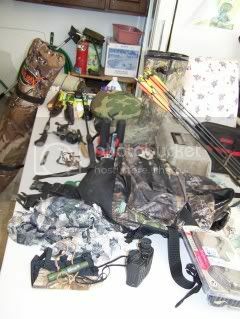 I’m trying to get ahead of the “packing” game, as I round up the things I’ll need for my bear hunt. It’s amazing how much gear it takes for one little hunting excursion. It is also baffling why I can’t find certain items, that I know I have around here somewhere. I just saw my LED headlamp, but do think I can find it. When my wife doesn’t even know where it’s at, I’m in trouble. How does a guy loose a guncase, yet not loose a gun? Same for my sable handled limited edition hunting knife. Oh I have the knife, but the sheath is missing! I have scopes on four of my rifles and shotguns, but only one scope cover that fits. I have three scope covers that fit none of my guns! Yesterday I was looking through my collection of flashlights, and counted nine of them. It seems like one of them would be in good working order wouldn’t it? Dead batteries, missing bulbs, broken switches, and corrosion have put the dimmer switch on any “candle-power” from these castaways. I was able to get one of the double AA lights to work, but ended up at Wal-Marts to buy a couple cheap lights and some batteries. I’m also missing the little connectors that hold together each section of my ladder stand, my screw in bow holder, and my scent eliminator spray bottle. “How can this be,” I ask myself, and I hear my wife say “Your so unorganized I’m surprised you find your Explorer in the morning!” Now I don’t think I’m quite that bad, but I will admit I need to get my act together just a little. Of course I could blame some of it on my hunting partners too. Most often I hunt with family, and if they can’t rob ya blind who can? Enough said! 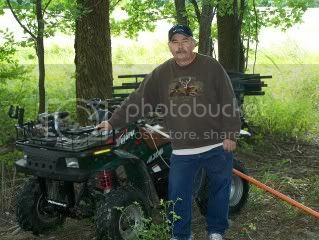 Getting ready to put up one of my deer stands. My old two stroke Polaris is about 14 years old, but it keeps on hauling the “goods!” I sure couldn’t hump everything a half mile back into the woods on my back! Maybe many moons ago, but now my “mule” does all the heavy work. It’s a 4-wheel drive and has gotten me “in” and “out” of some real nasty territory. On this trip I had to go partially through a swamp, and my little 325 cc explorer did just fine. When I bought it (many years ago) I paid around $3600.00 out the door. I just looked at a new one that was going to run about $7500.00 out the door. Ouch! No thanks I’ll just keep old “Betsey” till she falls apart on a trail somewhere. I just hope it isn’t way back in the “boonies” where I’m going to be bear hunting. My brother and his crew just got home from their bear hunt, and came up empty handed. He was having trouble with ravens and eagles getting into his bear bait. He started putting large logs over the bait, but it may of been to little to late. I go up in two weeks, and maybe that spot will pay off for me. Randy said it rained quite often while they were there, and that sure didn’t help the situation. Weather can make or break you on a bear hunt. Getting excited! It may not be the biggest buck rub in the world, but it’s fresh and only 40 yards from my tree stand. 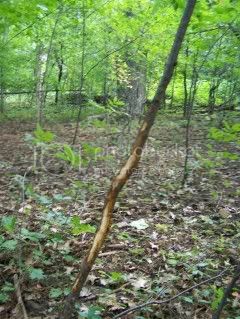 We found several small rubs like this one, in the general vicinity of one of my stands, and found tons of tracks. Runways were all over the place, and it quite evident that there are many deer in the area. This may be the year that “if it’s brown it’s down Mike” waits for a big shooter buck. It is my intention to pass on the lesser bucks and wait out Mr. Pope and Young. I have two stands placed on either side of a 3 acre pond that the deer have to funnel around in order to get at the acorns. I am excited and can’t wait to spend some time in the woods. 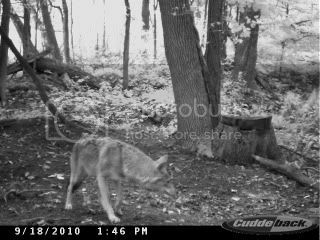 I also put out a new Cuddeback trail cam, and am hoping to see just what is making those extremely large tracks in the mud. I’m going back over next week, and will keep you posted if anything shows on camera. 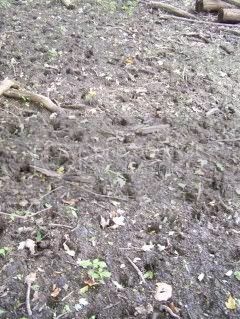 Lots of tracks in the mud around the pond. This is one of two big cottonwood trees I have in my yard. 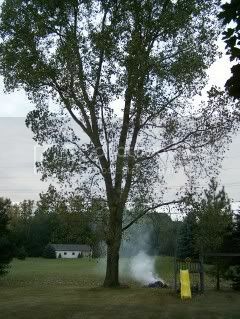 As you can see in the picture there is a pile of leaves burning under the tree. It’s the third time I’ve picked up leaves with my rear bagger, on my lawn mower this year. I have two other ornamental trees that are almost bare of their leaves. I think the heat, and lack of rain (recently) is causing a premature dropping of the leaves. I’ve noticed other trees in the area, even some maples, are changing colors. Maybe it’s just me, but it all seems a little early. Bow season opens on October 1st, as always, and usually a hunter is shrouded in a mass of green leaves. The woods doesn’t usually start to open up its canopy till the middle of October, but that could be somewhat earlier this year. I kinda hope so. That will work for me, cause I’m hunting some pretty thick cover this year. I’m thinking that our long, hot, dry spell might help the farmers with harvesting their corn and sow beans earlier also. It’s always nice to get the corn down, so the deer have one less place to hide. It was kind of funny, as I read Art Summers e-mail blog just before I wrote this one. He also wrote about the trees and the leaves, and the fall colors that are just around the corner. I thought “Art you stole my blog, but he couldn’t have, as his hit the blog-waves first!” I guess it’s just a matter of “great minds thinking alike!” Well at least “That’s my story, and I’m sticking to it.” Now lets go rake some leaves. 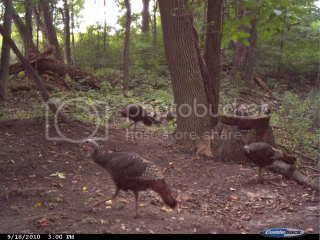 I’ll be arriving at camp a few weeks behind them, as my permit is for the third hunt period. Of the 42 bear we have harvested, over the years, the one in the above picture is the largest (heaviest.) It topped the scales at just over 500 pounds, but did not rank as high in the record book, as one my brother Darryl shot a few years after I got mine. Record books go by skull size, and Darryl shot a 5-1/2 year old bear with a huge skull. At one time it was the second largest ever taken with a recurve in Michigan. 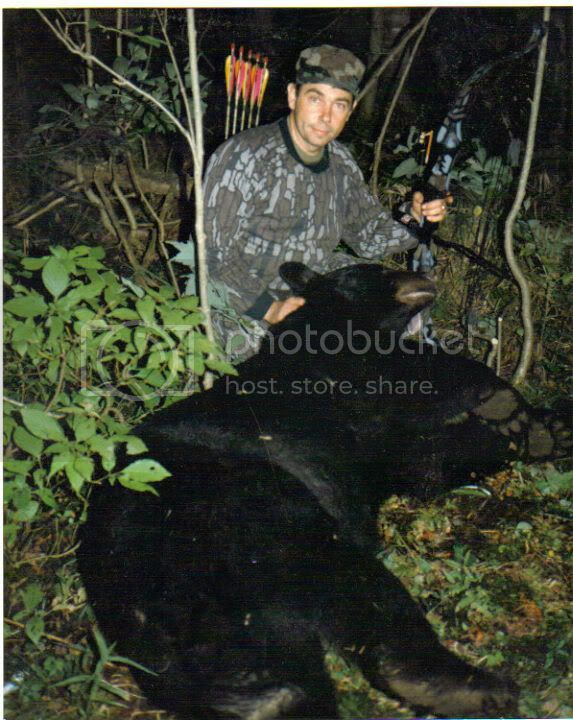 It also was a big bear (around 450 pounds,) but had the genetics for a “fat head!” My bear (above) ranked 17th. by Commemorative Bucks was an older boar being 13-1/2 years old. We have taken only three others that were of these proportions, with most bear being in the 150-250 pound range. Just like with deer the smaller younger bear have a better flavor when put in the frying pan. Just bought me a new trail cam, and I plan on putting it to good use. Been shooting my bow, but the heat has taken some of the enjoyment out of it. I’m praying for some colder weather at the end of the month. I know it’s hard to believe, but one year our water froze during the Sept 10th. bear hunt. I don’t expect that this year, but I’m hoping I’m not sweating to death either. Counting the days.